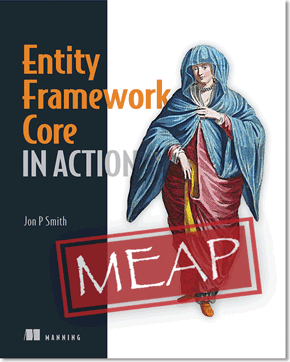 You can find my book, Entity Framework Core in Action on Manning's web site. Use the coupon fccefcoresmith to get 37% off. I wrote an article called Updating many to many relationships in entity framework back on 2014 which is still proving to be popular in 2017. To celebrate the release of my book Entity Framework Core in Action I am producing an updated version of that article, but for Entity Framework Core (EF Core). All the information and the code comes from Chapter 2 of my book. In the book I use a book selling site, with books linked to authors via a many-to-many relationship. You can see the live example site and if you scroll down you will see books with multiple authors. All the unit tests and classes I use in this article can be found in the Chapter03 branch of the Git repo associated with this book. NOTE: If you are in a hurry I have added summaries for each section – just search for the word Summary to get the answers without needing to look at the code examples. The example I am going to use is one taken from the book I am writing. It has a Book entity linked its Author(s) entities via a BookAuthor table. The database diagram below shows the three tables, with the foreign key links from the BookAuthor linking table to the other two tables. A linking table like this has foreign keys (FK in the diagram) which link to the primary key(s) (PK in the disgarm) of each end of the relationship – in this case the BookId of the Book entity and the AuthorId of the Author entity. These foreign keys then form a composite primary key for the BookAuthor table. EF6.x created this table for you when you defined a many-to-many relationship, but EF Core, which takes a leaner approach, doesn’t – you need to do it. Its not hard, so let me give you the code to define the BookAuthor entity class. NOTE: I have a property called Order because the order of the authors matter. If the order of items in your many-to-many list don’t matter then you can leave that out. I used the same names, BookId and AuthorId, of the primary keys in the Book class and the Author class. Because I used the classes Book and Author, which EF Core knows are part of the database, then it knows its a relationship. You can see the .HasKey method towards the bottom of the code where I define the composite key consisting of the BookId and the AuthorId. The easiest approach to setting up relationships is by using EF Core’s conventions, which is what I have done. But if you want to explicitly define the relationships you can, using the .HasOne/.HasMany Fluent API commands, as shown below. Note: There are loads of configuration rules, which I cover in chapter 6 and 7 of my book, or you can look at the EF Core docs. //If you name your foreign keys correctly, then you don't need this. NOTE: You can set the keys, but not the relationships, via attributes. The [Key] and [Order] attributes allow you to define the primary key, but I find the Fluent API is quite clean and easy to understand. Create a linking entity class that has the foreign keys(s) of the two entities you want to form a many-to-many link between. In my example these are BookId and AuthorId. It is efficient (but not necessary) to make these two foreign keys into the composite primary key. This will ensure that there is only ever one link between the two entities you want. It is also more efficient in terms of size of the database table. If you do want the two foreign keys to be the composite primary key you need to configure this in EF Core, either via Fluent API or by [Key]/[Order] attributes, because it cannot find them using its normal “by convention” method. If you use properties for the foreign key that don’t have the same name as the primary key it links to, then you must manually configure the relationship. There are a number of ways to do that, but EF Core’s Fluent API is quick and fairly straightforward to understand. The linking class can, but don’t have to, have relationship links to the two entities it links. In my example my AuthorLinks class has a property Book of type Book, and a property Author of type Author. You most likely want a collection relationship to the linking table in one or both of the linked entities. In my example I have property called AuthorLinks with the type ICollection<BookAuthor> in my Book class, and a property called BooksLink of type ICollection<BookAuthor> in my Author class. Creating new many-to-many link is fairly easy in EF Core (but not as easy as EF6.x). The code below creates a new book with a new author. Note: the variable context used at the bottom of the code below is an instance of the application’s DbContext, called EfCoreContext in this case (see its definition above). Disconnected state: This is where the update is split into two halves: a) select the entities you want to change, b) and make the change. Each stage has a different instance of the application’s DbContext. This happens on web sites, where in the first stage the user picks what they want done and posts it back. The second stage then has to re-read the data and update it. I am going to describe these two approaches separately, so you can go to the one that fits the application you are building. In the connected state we read in the Book entity and update it immediately, i.e. within the same instance of the DbContext. For my Book/Author example I am going to read in the Book, with its linking entities, BookAuthor, as tracked entities. – that means that EF Core will take a copy of the entities we read in so that it can spot any changes when you call SaveChanges. NOTE: I am using a Sqlite, in-memory database, which I seed with four books with known titles and authors. The most important parts of the code are lines 11 to 13. Here I load the Book entity using an Include method to load the AuthorLinks at the same time, as tracked entities. The AuthorLinks property holds a a collection of BookAuthor entities linking to the Author entities. Note: The default way of loading data in EF Core is as tracked entities, that is, EF Core takes a copy of the loaded data so that it can detect if any changes have happened since they were loaded. You can turn off tracking by including the method .AsNoTracking to your query (useful in read-only queries, as it makes them a little faster). In lines 15 to 16 I also load, again as a tracked entity, the Author entity who’s name is “Martin Fowler” as that the author I want to add to this book. Then on lines 18 to 23 I create a new BookAuthor linking entry linking the Book entity I loaded to the Author entity of “Martin Fowler”. When SaveChanges is called on line 24 it finds that the AuthorLinks property of the book instance it loaded has changed. Because this is a relationship it looks at the entities and finds that there is a new BookAuthor entity, which it adds to the database, and a author which is already in the database so it doesn’t have to add it. Load an entity at one end of the relationship (doesn’t matter which end) with the collection of links in the many-to-many linking table. In my example I loaded the Book entity I wanted to change along with its AuthorLinks property, which holds the collection of the linking entities in the BookAuthor table. Alter the linking table collection, either by adding or removing entries from the collection. In my example I added a new BookAuthor class to the AuthorLinks property collection. Note: if you want to replace the whole collection then you can simply assign a new list to the linking collection (there is an example of this in my unit tests – see test named TestChangeAuthorsNewListOk). In the second stage the web application needs to re-read the data and execute the database update. The unit test below does the same as the previous example, that is, it adds the existing author “Martin Fowler” to the book called “Quantum Networking”, which starts out with one author called “Future Person”. After the test has finished the book “Quantum Networking” has two authors, “Future Person” and “Martin Fowler”. I simulate the disconnected state by having two instances of the application’s DbContext and passing the primary keys of the Book and the new Author to add via a small class called ChangeAuthorDto. Note: This unit test uses two, separate instances of the DbContext to simulate the disconnected state. With the help of Daria (see comment below) I have found a way to use Sqlite in-memory with multiple instances of the DbContext. Daria pointed out that the in-memory part is held in the Sqlite connection, so I create one options (which uses the Sqlite connection) and used that to create two separate DbContext instances – thanks Daria. The important lines are 27 to 30, where I load in the Book, with its BookAuthor linking collection accessed via the Book’s AuthorLinks property, and I read in the Author that the user wants to add. Having loaded that book I can use the same code I had in the connected state, that is, I create a new BookAuthor linking entry linking the Book entity I loaded to the Author entity of “Martin Fowler” and add it to the existing AuthorLinks collection – see lines 32 to 37. In the first stage you should return the primary key(s) of the two ends of the many-to-many relationships that you want to link/unlink. In my example I provide the BookId and the AuthorId I want to add to the book. In stage two you load one end of the relationship (doesn’t matter which end) with the collection of links the the linking table. In my example I loaded the Book entity using the BookId key along with its AuthorLinks property, which held the collection of the linking entities in the BookAuthor table. Now load the other end of the relationship. In my example the Author entity, using the AuthorId returned from the first stage. Note: if you want to replace the whole collection then you can simply assign a new list to the linking collection with the new BookAuthor class. In chapter 3 of my book, Entity Framework Core in Action , I point out that you can often change relationships using the foreign keys, and it can me more efficent. This is especially true of many-to-many relationships because you can directly add/delete entries from the linking table, in this case BookAuthor. By directly adding/deleting the linking table entries then it saves you having to load the Book entity with its AuthorLinks property and the Author you want to add. Coupled with the fact that the first stage is going to supply you with the primary keys anyway then it saves quite a few database queries. The unit test below shows this in action. The first stage of the unit test hands back primary keys of the Book and the new Author to add via the ChangeAuthorDto class. The second stage, which uses a new instance of the DbContext, uses those primary keys to build a new BookAuthor linking entity to add to the database. NOTE: The one downside of this approach for my Book/Author example is the setting the Order property, as it should be set to get the correct order of the authors. For this example know there is one author with an Order set to 0 so I simply set it to 1. In real application the first stage would have to define what order the authors should be shown in. And the Author that I wanted to add. In this case I added an extra author. I could have removed an author by deleting the appropriate BookAuthor entry. I do recommend this approach for many-to-many relationship updates because it is more efficient and still quite clear in its intent, i.e. its not complex so its obvious what is happening. In the first stage you should return the primary key(s) of the two ends of the many-to-many relationships that you want to link/unlink. In my example I provide the BookId and the NewAuthorId I wanted to add to the book. In the second stage you should add/delete entries from the linking table directly. For instance to add a new many-to-many relationship you add a new entry in the linking table. In my example I added a new BookAuthor link with its BookId property set from the BookId returned by the first stage, and its AuthorId property set to the NewAuthorId value from the first stage. Setting up and changing many-to-many links in EF Core is harder than in EF6.x. EF 6.x used the same approach as EF Core, but “hid” the linking table and the manipulation of that table from you. That certainly made it easier, but as the continued access to my original article on updating many-to-many in EF6.x shows, it can cause confusion sometimes. At the moment EF Core makes you configure the linking table and update that linking table yourself. The EF Core roadmap says it will look at automating this in the future, but not for now. But I think there are some benefits in knowing what is going on in the database, and, as my last disconnected example shows, you can sometimes be more efficient that EF6.x is at updating many-to-many relationships. I cover this an much more in my book Entity Framework Core in Action and you can access the unit test code you see here via the Chapter03 branch of the Git repo that goes with the book – see the test class Ch03_ManyToManyUpdate.